I found this ad online and I immediately became intrigued because we seem to think that wrapping everything in bacon before cooking it is a modern invention. That point of view couldn't be any more misguided as this 1936 ad for Armour Bacon shows. Unfortunately the recipe was not included in the ad, just a note to "Ask your grocer for the recipe folder". Hmm, another thing we still do to this day, grocer inspired recipes. I posted this ad to my blog's Facebook page and immediately started getting requests for the recipe, I suppose the siren call of crisp bacon is too much to ignore so I set about searching for the lost recipe. Now this is where I truly shine when it comes to vintage cooking because I am the Jedi Master of the search. It didn't take long to hunt down the recipe on an old edition of the Deseret News thanks to Google and the Gutenberg Project. While the ad may claim this is a frugal recipe, that is not the case today as it calls for 1/2lb of ground veal and veal is very dear right now. I replaced the veal with ground chuck and the recipe came out fine. The article claims you get "10 generous servings per roll" and they are quite right. We ate it for dinner 2 times and I had enough for lunch for a couple of days. In a bowl combine your meats, salt and pepper. Take a piece of wax paper and spread out meat mixture until it's about 8 x 11 inches. In a pan melt butter and saute onion until transparent. Combine bread crumbs, salt, olives and onion in a bowl then add egg and fold in. Moisten with hot water and the stuffing should be of a proper consistency. If too dry add a little more water. 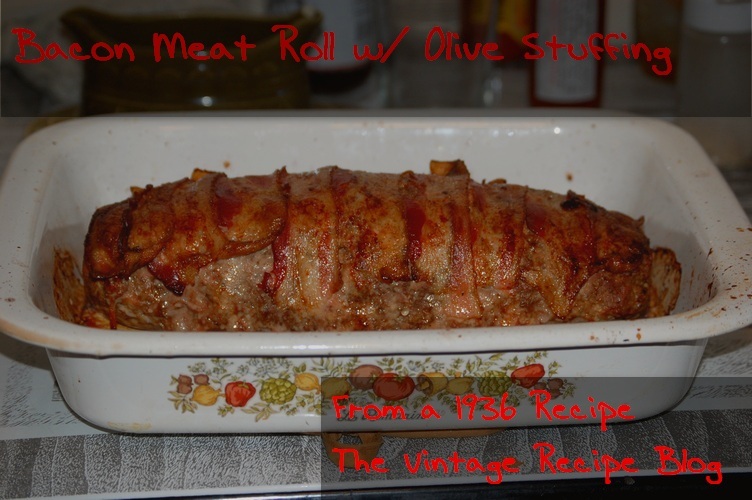 Form stuffing into an 10 inch roll in the center of the meat then form a log by bringing up the edges of the wax paper and pinching meat closed. 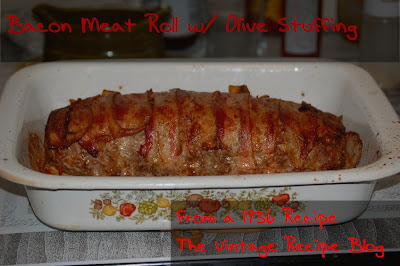 Place in roasting pan and lay strips of bacon crosswise across top of roll tucking in under the side. I cut my bacon slices in half before doing this step. Set your rack in the oven one notch above center and set for 325°. Bake 1 hour, bacon should be crisp. If desired you can baste with the accumulated bacon drippings in pan.